“Tarte Tatin is the second-best apple pie in the world…” started the The Wonders of Tarte Tatin article. Don’t remember how I found it, but the phrase got me and I had to keep reading. I can just give my respect to Edward Schneider for such a great opening. “…After Jackie’s Polish-style szarlotka” it continued, following up with a detailed description of the Tarte Tatin and its wonders. I skipped this part and went to search the web for the Polish pie. 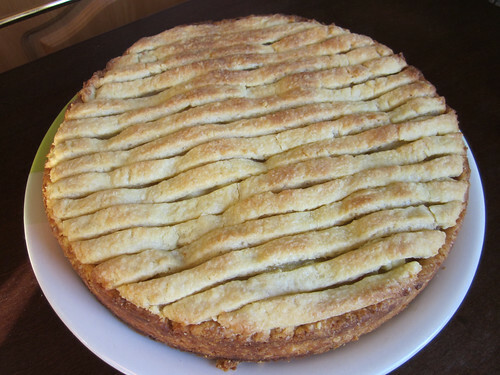 I don’t know exactly which recipe the author meant, but one of the Polish apple pies I found really got my attention. The idea is that very sweet and reach short pastry shell holds the sour apple filling. The apples get precooked, so they cook down and form a thick, dense and intense layer. The top gets again covered by pastry array, which gets crispy delicious while it bakes. Last weekend my parents got back from Florence. That was a rare occasion they didn’t have any willingness to cook themselves as they were tired. So I offered to bake an apple pie to welcome them back and they agreed. I must say it turned out quite labor intense. Nothing complicated, but you have to peel, core and chop some 1.5 kg of apples and knead a considerable amount of dough. I got lucky with my mom ready to deal with the apples, so we installed ourselves in the kitchen and spent some 2 hours there chatting (we can always do as much chatting as needed, just give us a chance). The pie came out completely worth the effort. Everybody in the house seemed to like it. Despite its impressive size, three quarters were gone immediately. I’m not going to say whether it is better than Tarte Tatin though. To me, the more different great apple pies I have in my collection, the better. Each will find its ideal occasion to fit in. For the pastry, combine the flour and chopped chilled butter. Mix together to get to the texture of bread crumbs. It's easier to use food processor, but you can also do it with your hands. Mix in the sugar and salt. Add the egg yolks and sour cream. Mix to get even pastry that holds together. Cover and chill in the fridge for an hour. Mix the chopped apples with lemon juice to prevent them from getting brown. Set a large frying pan over high heat, add in the apples (no oil needed) and cook stirring for around 10 minutes. The apples should soften and most of the liquid should evaporate. Remove from heat and let cool. Butter a 22 cm round cake pan slightly. Take 2/3 of the pastry out of the fridge and roll it into a circle. Cover the bottom and sides of the pan (the border should be around 3 cm tall). Fork the pastry shell and prebake it for 12 minutes in 180C oven. Take out and let cool a bit. Roll the remaining pastry 3-4 mm thick and cut it into stripes 1 cm wide (it seems that pizza knife is the best instrument for that, but surely you can use an ordinary knife). Fill the pastry shell with apples. Spread them evenly and slightly press down, to form a dense layer. Arrange the pastry stripes on top of the apples in parallel to each other, leaving almost no space in between. Bake the pie for 25-30 min, till the top gets golden. Take out of the oven and let rest for 15 minutes. Then it easily cuts into nice pretty pieces. It was perfect just on its own and we didn't get to complementing it with anything. However I can imagine, that if you have a bit more patience, it will be great with vanilla sauce or ice-cream. Hey i love apple pie and now i am learning myself how to make it, thanks for sharing your ideas in this post. Oh, that's great news! You are very welcome :-) Enjoy it a lot! That looks beautiful! Would it be blasphemous to add traditional apple pie spices? thank you! :-) you mean clove, cinnamon etc.? I must say it tasted quite self sufficient with virtually no spices. Probably that's because both the precooked apples and the pastry are quite intense and there is good contrast (sweet / sour) between them. However if you have a feeling for that - do try, why not? Keep me posted if you do. Hi, Polish there! I'm glad that you liked our szarlotka, it's one of the most favourite cakes among Polish. Therefore there are some variations which I thought you may be willing to try :) Sometimes the filling may be spiced with cinnamon or clove; there are also raisins or almonds added to it. The stripes of the top layer are sometimes not arranged parallel to each other, but they are formed in a form of a truss (not sure if the comparison is good - but they form a kind of check; I think that these photos illustrate it well: http://notatnikzprzepisami.blogspot.com/2011/03/szarlotka.html). I find szarlotka with the "checked" top layer particularly decorative :) And, as you can see, some sprinkle it with powdered sugar. Oh, I'm sorry for this long monologue, but szarlotka is very exciting problem, since everyone claims her/his recipe to be the best :) Good baking! Oh, thanks so much for sharing this! I'm very interested in finding out these details. The checked szarlotka is really pretty, next time I'll try it this way. An adding almonds also sounds delicious to me. Looks like fearandloathing question about whether you can use the clove and cinnamon in this pie was exactly looking into the existing recipe variations :)! It's so nice to match a name to this delicious pastry. On the rare occasions I pass through the nearest Polish neighborhood, I usually stop by a bakery to buy a 5 pound slab off a huge baking sheet on the counter.